Home Excitement Imagination Inspiriation Learning Passion Reading Students Success Teachers Writing Imagination is Fundamental! Imagination is more important than knowledge.” Albert Einstein. Imagination, also called the faculty of imagining, is the ability of forming mental images, sensations and concepts, in a moment when they are not perceived through sight, hearing or other senses. Imagination helps provide meaning to experience and understanding to knowledge; it is a fundamental facility through which people make sense of the world…. I was pretty much skimming the words until the last sentence. Then, I was hooked. This was the perfect definition: Imagination is fundamental! I’m one of those people who can remember vividly using my imagination throughout my childhood. I was stunned to learn that others did not have magical friends to keep them company and share secrets. When I was in elementary school, the playground was surrounded by overgrown forsythia, weeping willows and an assortment of overgrown shrubs. There was a group of us that had magical adventures underneath the covered weeds and brush. We may not have had a wardrobe to travel through like the Pevensie children in Narnia, but sneaking away from the blacktop was the highlight of every day for months – until we were caught and had to do the time. As a teacher, one of my greatest accomplishments is when I inspire a love of reading. The success is doubled when I foster imagination, too. My favorite starting point is Roxaboxen by Alice McLerran. Somehow this breathtaking author peeked inside my memories and captured my favorite place. I never know when I will bring it out, but I always have it ready for the right “teachable” moment. Roxaboxen can only be found when you look in the right place. This year my third graders were having a poetry lesson and the moment presented itself. They were asking the wrong questions and I knew we were getting off track. It was time. The right mood was set – the kids know when I’m about to share a personal story. I told them about the secret place behind the playground. They loved the part about me getting in trouble. Then, I read Roxaboxen and when I reached the end, the mood was electric. (I admit I am a bit dramatic.) As soon as I finished, I read it again. They loved this! Next, I asked them to see if they could find Roxaboxen at recess and at home. For many, they were bursting with goose bumps and couldn’t wait to share magical details. Admittedly, not everyone jumped on the imagination bandwagon, but it was a good start. The next day many of the students were sharing stories about the various Roxaboxen places they had found. It was becoming contagious and spreading to other grades. Everyone wanted to visit Roxaboxen. I passed the book to a few colleagues who read it to their students. This one word acted as a catalyst for imaginary play. Back in the classroom we segued into a discussion about the importance of using visualization, schema and prior knowledge while reading. At this point, some might expect me to include a list of great books that inspire imagination. I disagree. When my students choose books from the classroom library, I do not give directions such as, “Find a book that inspires your imagination.” I let their imaginations, interests and desires guide them. My job is to share and inspire, and then let them soar on their own imagination wings. Hopefully, they will take a piece of Roxaboxen with them and remember that imagination is fundamental and helps us make sense of the world. Have you visited Roxaboxen lately? Love your posting on imagination! It reminds me of the movie "The Bridge to Tarabithia". If the ending wasn't so sad I'd recommend it without reservation. I also had a childhood of imaginings...unripened concord grapes were emeralds that we polished to add to our 'princess treasure trove'. My friend had a trunk full of dress up costumes to add to the 'kingdom' we ruled. Can you believe that I was never introduced to The Chronicles of Narnia until I was an adult? What a shame! I would have loved to have been a part of that kingdom as a child! oh, great post! 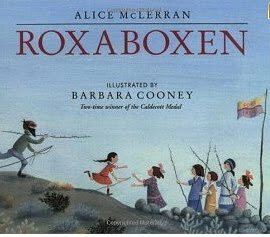 Roxenboxen was one of my favorite books when I was doing "Five in a Row" with my kids! there is also one called "pretend you're a cat" or something like that, but it goes through all these animals and rhymes, lots of fun! I love Roxaboxen!! It's such a great resource to inspire imagination. And the perfect book to get overly dramatic with (I'm a big ham in my classroom too!). Glad it was such a hit!